Medic has very few unlocks, it’s true, but this really is because almost every niche he’d need filled is already in there somewhere. The lion’s share of discussion on this topic is dedicated to his secondary Medigun, but what about his options in primary and melee? Well, for a change of pace I thought I could cover every single available weapon combo in Medic’s Primary/Melee slots, how they synergize, and their viability and effectiveness as a combo. I’m leaving out the bonesaw because it should never be used ever. Space Guns also not included. Crossbow/Amputator: If you’re going to use the Amputator, this is the loadout. The extra regen will let you outheal afterburn, and a whole cadre of effects like bleed and SMGs and miniguns become less effective. The downside of course is that you have very little in the way of self-defense, so make sure you can rely on your teammates to protect you. Crossbow/Vita-saw: Everything above applies, but you are even more vulnerable. Play even more cautiously than with the Medieval set, and make sure you learn to use the crossbow effectively. I know that if you land every shot, you can dissuade any pursuers long enough to escape a sticky situation, but it requires lots of practice to perfect your aim. Crossbow/Ubersaw: Since crossbow medics have to rely on melee to make up for the weaknesses of their primary, this is a great saw to use. Expect to have to pop some ubers just to escape with your life, though that’s better than you can say for the above loadouts in the same situation. Crossbow/Solemn Vow: I have heard that this makes a great finisher; play a conservative medic, and if an enemy ever retreats at low health, hit them with an arrow between the shoulder blades. Possibly balanced with the Medieval Medic set, and also requires good team communication to make effective use of the new information. Blutsaguer/Amputator: Since Amputator’s buff these two enjoy a very odd synergy. 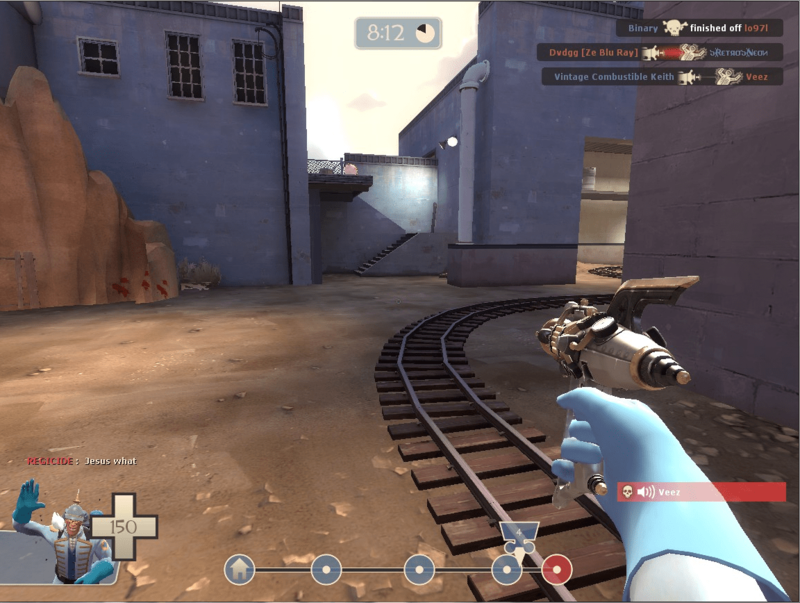 The Amputator can come out when your lowered Blutsaguer regen is threatening your life, and both deal with Medic regaining health faster than normal. Certainly better than they fit together pre-buff. Blutsaguer/Vita-Saw: A great melee to go with the blut, because you will find yourself dying more often due to the lack of regen. Just know that you are as fragile as a medic can get and play accordingly. Blutsaguer/Ubersaw: A balanced loadout for medics who use all three of their weapons regularly. This makes for a self-sufficient medic; without team support, you can regain health and build uber through combat if you have the prowess. This may lead to bad habits that don’t easily transfer to other loadouts, and the lack of emphasis on healing others can hurt the team. Blutsaguer/Solemn Vow: The blutsaguer being a combat weapon, it’s good to know when you should fight and when you should run, so these two synergize very well. See the warnings of the above set. The Syringe Gun, being stock, goes well with any melee weapon. The question more becomes what melee do you like the best. In order, I’d say Ubersaw, Solemn Vow, Vita-saw, Amputator for best synergy. Every combo works almost as well as the next in the chain. Overdose/Amputator: A very utility-based medic, designed to help teammates but also be able to escape combat if the going gets tough. Not that much synergy, but instead you get versatility, capable of healing teammates, healing yourself and dodging enemies when the need arises. Overdose/Vita-Saw: Enjoy a 2% speed boost straight from respawning when you reserve 20% ubercharge. The Overdose is designed to keep you alive, and the Vita-Saw is designed to kill you, so they balance out, but try to avoid direct combat. There is synergy, though. Overdose/Ubersaw: These weapons complement each other well, since every hit with the melee speeds you up with the Overdose. Play hit-and-run to stay alive and use your newfound ubercharge. Overdose/Solemn Vow: These weapons came out together, but they don’t really synergize as well as some other choices. The Solemn Vow offsets the damage penalty, letting you know whether you can win this fight even with the weaker syringes. Ultimately, I found that the weapons fit neatly onto a small chart that showed the various primaries and melees in order from utility (favored for doing something other than attacking), to self-defense (favored for doing a weapon’s job of keeping you alive). So decide which you want; stopping/dissuading power, alternate forms of Uber-building and self-healing, or a combination of both. There’s no real bad Medic set. Unless it includes the bonesaw.